My first blog post. Wow! I plan to share the journey of playing the Blackmar-Diemer Gambit chess opening for the past 25 years. I begin with a blitz game that I just finished. My game began 1.d4 (The normal path to the BDG.) 1...d5 2.e4 c6 (Black tries to avoid the Blackmar-Diemer Gambit with the Caro-Kann Defence. The main line BDG continues 2...dxe4 3.Nc3 Nf6 4.f3 exf3 5.Nxf3. Here 5...c6 would transpose to the game.) 3.Nc3 (Other popular choices vs the Caro-Kann Defence are 3.e5 and 3.cxd5) 3...dxe4 (3...g6 is a Modern Defence.) 4.f3!? (I like to head back toward the BDG. 4.Nxe4= is the normal Caro-Kann.) 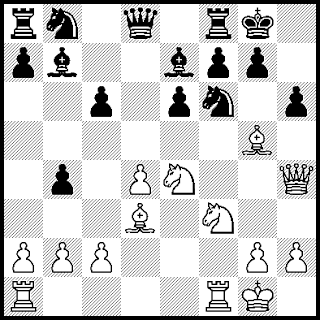 4...exf3 5.Nxf3 Nf6 (BDG Ziegler Variation).